Having a garage is ideal for keeping your car shaded from the hot, Arizona sun so that the seats don’t feel like the racks on a grill when you sit down. Your garage is also a great place to store everything from your lawn equipment to last season’s clothes. Unless you want your garage to turn into an oversized closet that is stuffed to the gills with piles of everything that doesn’t have a place in your home, you will need to install the right cabinets to get the space organized. Not only will Scottsdale garage remodeling make it easier for you to find what you need, but it will also improve the value of your home. You can’t know what kind of storage you need until you know exactly what you have that needs storing. Go through your garage and get everything organized. Put all the yard tools together, all the Christmas decorations together, all the seasonal clothes together, and so on. Once you take stock of what kind of things you will be storing in the garage and how much you have of each grouping, you can start thinking about what kind of cabinets you will need. Take this opportunity to downsize and get rid of anything that you don’t need anymore. Have a yard sale or drop the items at Goodwill. You will have less to store, which means that you’ll spend less on cabinets. Figure out where you want your Scottsdale garage cabinet installations and measure that area carefully. Measure the length and height of the area where you want the cabinets, and take note of any issues that might arise with depth. For example, you may have a refrigerator in your garage that cannot be blocked by a protruding cabinet. Make sure the area is clear, or make a careful measurement of the needed depth. Measure at least twice to ensure that you get a precise measurement. You don’t want to get the cabinets and find out they don’t fit. It will be a huge hassle to return them — if you can return them, that is. Tall cabinets are best suited for storing rakes, weed whackers, and other lawn equipment, while metal cabinets are best for storing motor oils and other fluids that can be caustic to wood or plastic if they spill. You don’t want to just order the right size cabinet, but also the right type cabinet. Consider whether you need tall cabinets, cabinets with drawers, slim cabinets, cabinets with glass doors, metal cabinets, wood cabinets, and so on. By choosing the right type of cabinet to fit your needs, you will get the storage you want while also saving space and money. Most people have a garage with plain white walls or unfinished drywall for walls. But if you are investing in garage remodeling, you probably want a better look than that. Either you have a specific decor scheme in mind for the garage or you want to match the general style of your home. Choose cabinets that complement this style. Consider both color and texture when choosing the style of the cabinet. Even small changes can make a big impact on the overall look. Cabinets vary widely in price based on their size, style, and quality. Set a budget before you start shopping to ensure that you don’t spend more than you want. If you aren’t able to get the exact cabinets you want on the budget you set, sacrifice elements of style before you sacrifice quality. It is better to get a more plain-looking cabinet that is made of high-quality wood than it is to get something that looks flashy but is made of particle board that will crumble in just a few years. 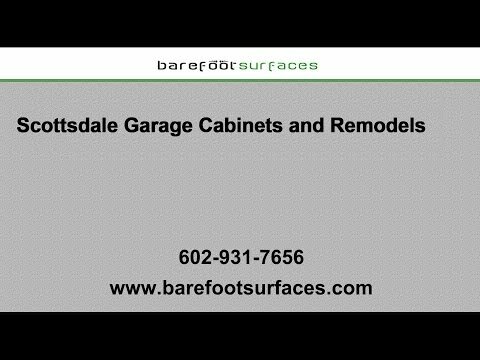 Barefoot Surfaces specializes in garage remodeling, including garage cabinet installations, North Scottsdale epoxy flooring and Scottsdale concrete floor resurfacing, as well as providing you with patio epoxy coating contractors in Scottsdale. We sell a large selection of high-quality cabinetry in a variety of sizes and styles to help you get your garage organized and looking great. With the right Scottsdale cabinets, you’ll be able to quickly find what you need, and you’ll enjoy spending time in your garage. Visit our site to explore our selection and find the perfect cabinets for your garage remodeling project or contact us today to learn more.